Aaron Neuwirth reviews Ralph Breaks the Internet, the rare Disney sequel that tries to do a lot with another adventure with this fun animated pairing. 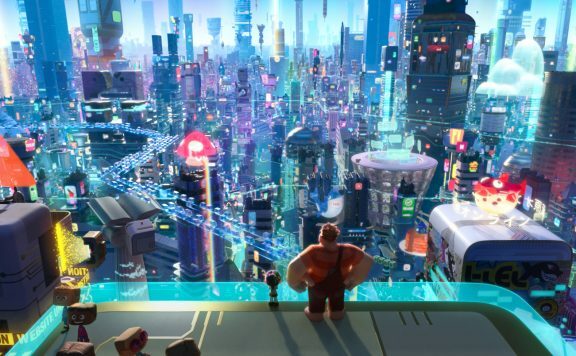 Packed to the gills with references to movies, video games, social media services, viral videos, and online culture in general, Ralph Breaks the Internet seemed primed to offer a lot of good fun and work as a nice companion to 2012’s Wreck-It Ralph. Directors Rich Moore and Phil Johnston return to explore more of the world they helped create, with a focus placed outside the arcade this time around. John C. Reilly and Sarah Silverman return to their enjoyable roles, but the film has an odd time leveling up from the first. While Ralph Breaks the Internet has a lot of ideas on its mind and does its best to explore them in a PG-rated Disney environment, I couldn’t help but think the film struggled to be consistently funny. It is no doubt enjoyable and manages to work on some other emotional levels, but I can’t quite call it the game of the year. 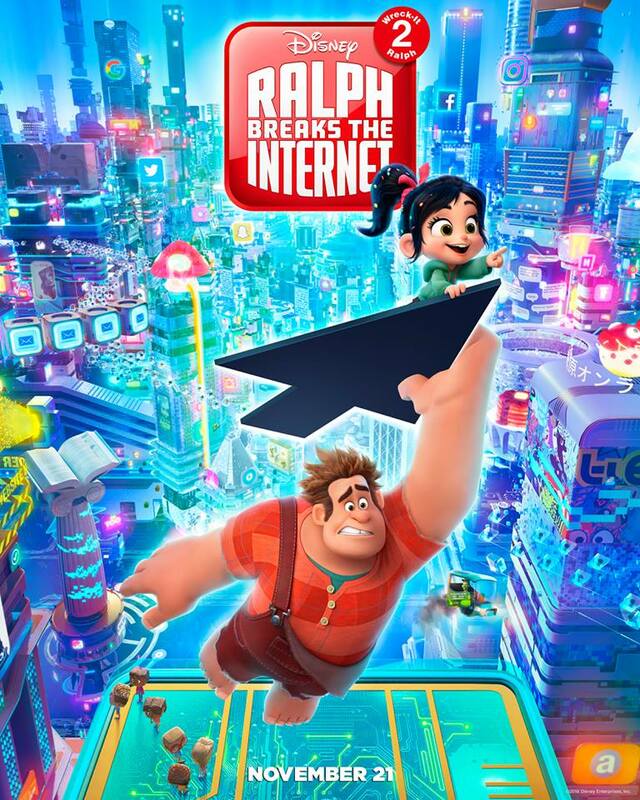 Set six years after the soft-hearted Ralph (Reilly) realized he’s okay with being the villain of his arcade game, as long as he can keep hanging out with his friend Vanellope (Silverman) and get a little more respect, the arcade is finally given an internet connection. With Venellope’s Sugar Rush arcade game being out of order, Ralph and Vanellope decide to sneak into the internet to find the part needed to fix it. Once inside the world wide web, the two have encounters with the many good and bad things that await those who venture online. Given the potential of a film like this, I am curious if there’s a reaction to be had that separates the audience opinion of this film from the rest of the pack. Be it the pop culture noise found in lesser DreamWorks Animation productions or the dreaded Emoji Movie, can Ralph Breaks the Internet succeed in trafficking in similar joke territory? I ask this because I can’t say I found a lot of great comedy in simply seeing jokes delivered by characters pointing to things you recognize from reality. With that in mind, I can applaud the work done by the animation team to fully realize the internet in a similar manner to what made the video game-infused Wreck-It Ralph work. To go a step further, there’s far more variety in what is seen, so the film doesn’t feel trapped, compared to the heavy emphasis on Sugar Rush seen in the first film. There’s creativity in the creation of things like avatars, transmitting information across the internet, the nature of viral videos, and other neat opportunities to bring a new dynamic into this series. The occasional jump to showing the real-world counterparts react to online disruptions was also a good choice. Still, if the jokes only go so far, and yet the animation is worthy of praise, as is generally the case with Disney features, what’s tipping the scales in the film’s favor? Well, the nature of Ralph Breaks the Internet’s dramatic themes does the trick in showing off the deeper layers found in the screenplay by Johnston and Pamela Ribon (with plenty of help from other writers, as well as Reilly). 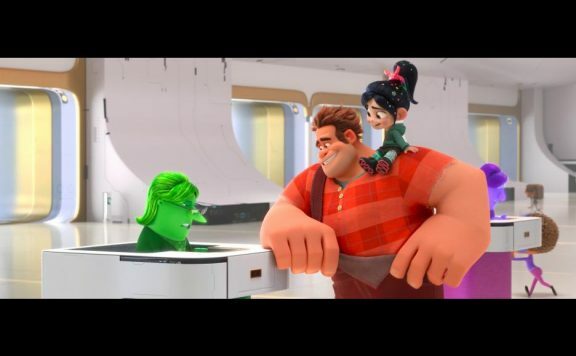 While the first film concerned itself with coming to terms with certain positions in life, as well as what it means to accept friendship and help from others, the ideas in Ralph Breaks the Internet are more complicated. With a kid-targeted film working to explore the nature of the internet, that means getting creative when it comes to exploring the various sides. 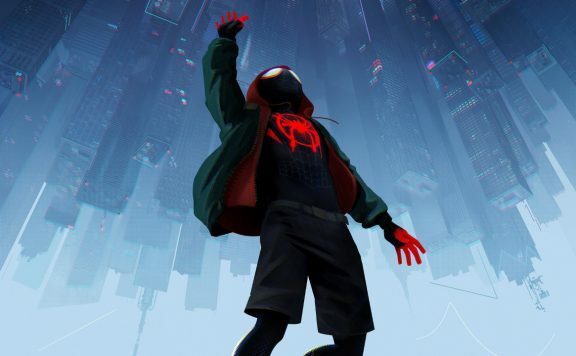 There is a lot to admire in how the movie examines the good that can come from connecting to the online world and finding ways to express one’s self. 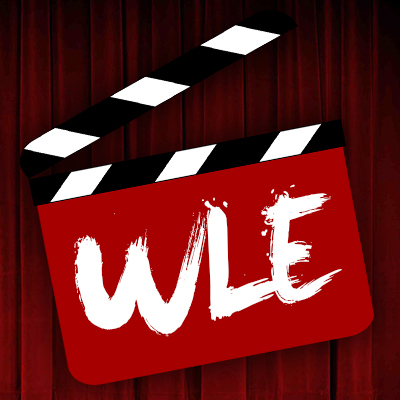 However, the film wisely puts a considerable amount of work into presenting the darker sides of the internet, where toxic culture can do real harm thanks to areas such as the comments sections of public posts, as well as the financial traps people can find themselves in if they are not careful. The deeper layers extend to Ralph and Vanellope. While there is the primary drive for these characters as far as fixing their game, things become more complicated when Venellope realizes she’d like to stay in the internet and be a part of the free-to-play game Slaughter Race, where she finds herself more at home. Ralph, not being happy about potentially losing his friend, ends up going to drastic measures, which provides interesting commentary on how relationships can work, in addition to building towards a vivid level of imagination brought to life via even more superb animation. So as a drama, Ralph Breaks the Internet does have a lot to say, which is fine. I wish it could have built a better comedy out of the material explored, in addition to finding new ways to make an audience emotional over these characters. Nevertheless, there is a lot to like in some of the new voices and key sequences that have been promoted so heavily in the marketing. Using the Disney Princesses in extended cameos proves to be a lot of fun as a way of sending up the images of these characters in a positive way, sure to make many viewers smile, while also subverting certain expectations when it comes to their effect on the story. Good fun also comes from a few new additions such as Taraji P. Henson’s Yesss, a character who serves as an algorithm to track video views, as well as Alan Tudyk’s latest Disney appearance as KnowsMore, a stressed-out search engine. Less successful is the lengths gone to make Slaughter Race into a compelling part of the narrative. With the film already being quite long for an animated feature, I wasn’t so enamored with what seemed like an excuse to put Gal Gadot’s Shank character back in a Fast & Furious type world. Coupled with doubling down on previously explored ideas involving friendship and a song that’s both kind of funny and sort of terrible, it’s as if this film is straining to fit a lot into an already stuffed feature. 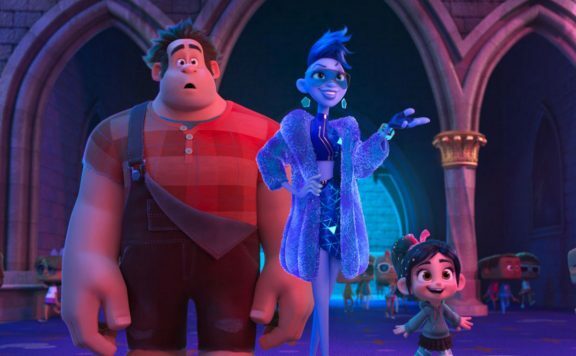 Ralph Breaks the Internet is far from bad, as Disney doesn’t tend to put out too many animated films of the same quality as Home on the Range, but I did find more interest in what the movie was about than how much it made me laugh. It is quite entertaining, and as the animation studio’s first narrative-based sequel since The Rescuers Down Under, this is a character pairing I was happy to see on screen again. Even with the world explored a bit more, perhaps it’s how much more I was into the video game focus of the first film, compared to this expansive and less funny sequel. Regardless, Ralph Breaks the Internet is a big, colorful adventure that is sure to entertain many. Ambition doesn’t wreck the film, but the Wi-Fi connection could be stronger.